Occupational health programs and clinics undergoing site certification are evaluated in comparison to NAOHP standards in six categories: administration and organization; operational framework; staffing resources; clinical services; quality management; and sales and marketing. Provide occupational health programs with strict benchmarks to ensure that their policies and standards are consistent with the best national practices. 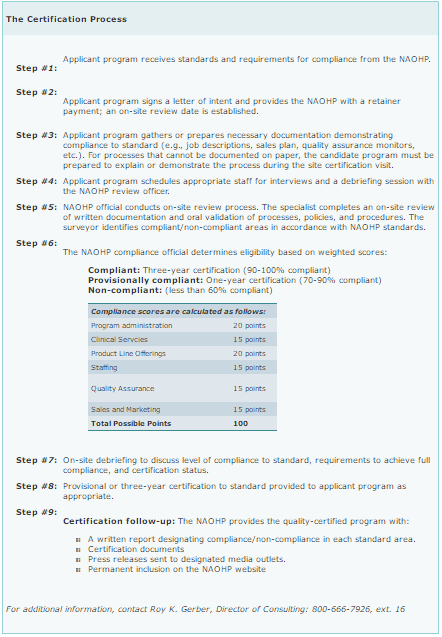 Identify any deficient areas in which an applicant program might improve in order to meet the highest and most cost-effective standards. Reward applicant programs that measure up to the highest quality standards with tangible recognition.